Mr Pothen (Peter in Malayalam) lived opposite our home across the street and everyone called him Kunjappan suffixed with ‘Chettan’ meaning an elderly man. Kunjappan Chettan was the village trader who ran his business from his home. He traded mainly in pepper, nutmeg, natural rubber, eggs and dried tapioca (cassava), which the villagers produced. I have seen him from childhood always wearing a spotless white dhoti with a white towel which always hung from his right shoulder. He visited the nearby village markets too to collect the merchandise he traded in. He never wore a shirt on his business trips, but used to wear a white shirt while going to the church on Sundays, visiting his relatives or going to Kottayam town. Kunjappan Chettan was very popular with the women folk as he used to buy all the eggs their hens laid – the free range ones. The ladies would use the money to buy fish the next day or meat on the weekends. The entire households in the village produced their own vegetables in those days and the only purchases were limited to onions and tomatoes. Nowadays the situation in our village is that hardly anyone produces any vegetables, mainly due to non availability of labour and with the advent of rubber cultivation. The women folk liked him for not that he provided the best price for their eggs, but that he would accept cracked eggs too, unless they were leaking. The secret behind it was that he was supplying his eggs to Mr Rozario, an Anglo-Indan who ran the best bakery in Kottayam town. Mr Razario would accept all the cracked eggs as he had to crack them anyway. Mr Rozario’s pick-up van would visit Kunjappan Chettan every Fridays to pick-up the eggs he had collected the entire week. All the spices and the rubber procured by Kunjappan Chettan had to be transported to Kottayam market, 12 km away, to be sold to wholesale traders. Pappchan with his bullock cart provided the transportation services. 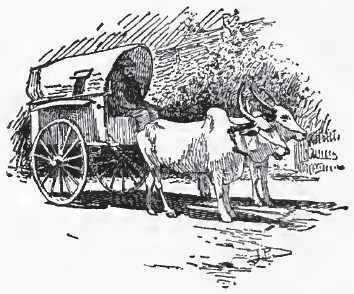 Pappachan had a bullock cart, pulled by two hefty bullocks, and he always addressed them as his sons. He would never hit them and would always be seen talking to them. Whether the bullocks understood anything what Pappachan said, they would silently stand in front of Kunjappan Chettan’s home until the cart was fully loaded on Monday evenings. After the loading was completed, Pappachan would tell his sons to proceed. Pappachan would go off to sleep and the bullocks would pull the cart and by early morning reach the market gate. Pappachan would hand over all the merchandise to the wholesale dealer and during the day pickup stuff for the village store and any other materials anyone else would have ordered. He would commence his return journey by evening and the bullocks would find their way to Kunjappan Chettan’s home and reach early morning Wednesday and all the while Pappachan would be sleeping. The modern trucks have driven these bullock-carts to extinction. Kunjappan Chettan’s family and our family had a healthy relationship. All the children went to school together, played in the evenings together and we always formed part of any celebrations in either home. This relationship has carried over to the next two generations. In those days Mr Chackochan (Jacob in Malayalam) was the only one who owned a car in our village. The magnanimity of Chackochan ensured that his car always doubled-up as an ambulance in emergencies for the entire village. Now every household has at least one. Chackochan belonged to the richest family of our village. He ran a coconut oil mill. The mill had a telephone and it became a village property and always carried urgent messages for the village folks. The workers in the mill doubled up as messengers who ran to the home of the recipient of the message to convey it. With the introduction of cell phones, anyone and everyone now owns a cell phone. Kunjappan Chettan’s grandson used to be asthmatic during his childhood and used to get severe attacks and he had to be rushed to the hospital about 5 km away. Chackochan would always come with his car to provide the ambulance service, even at midnight. While I was on summer vacation from Sainik (Military) School, the boy suffered a severe attack at midnight and I was asked to run (being the fittest) to Chackochan’s home to fetch the car. On reaching Chackochan’s house, I opened the gate and went to the front door and rang the bell. Chackochan came out and asked me as to whether the dogs attacked me. That was when I looked behind and I saw two German Shepherds staring at me. No one ever told me that there were two German Shepherds guarding the house and one had to use the bell at the main gate to call Chackochan. The dogs must have got really confused on seeing me confidently and fearlessly opening the main gate and running up to the front door. With the arrival of modern transportation systems, the village trader’s role diminished as the villagers could sell their produce directly to wholesalers at Kottayam and also buy and transport goods from there. Mr Rozario became old and closed down his bakery resulting in lack of demand for eggs. Thus Kunjappan Chettan retired, closing down his business. Ah, the joys of growing up in a place where everyone knows everyone else, like a big joint family! And in your case Reji, not just human beings, looks like the dogs also knew you, without your knowledge. In the Army we were adept at writing pen pictures of the men we commanded. Here you have written a pen picture of the entire village, dogs and bullocks included. Very nice post Sir, this reminded me of old malgudi days from R K Narayan, The villages of old and the characters therein, are reduced to sweet memories in the mind. Thank you for sharing..
Reji, excellent. Brings back the nostalgic memories of the good old days. There were many such Kunjappan Chettans those days. Hello sir,, very interesting account of the good ol’ days. Your blog was brought to my notice by Colonel Vinayagam (Artillery wale) 🙂 …. and I have been a fan since then! Cheers sir! !